More than an address, it is a lifestyle! 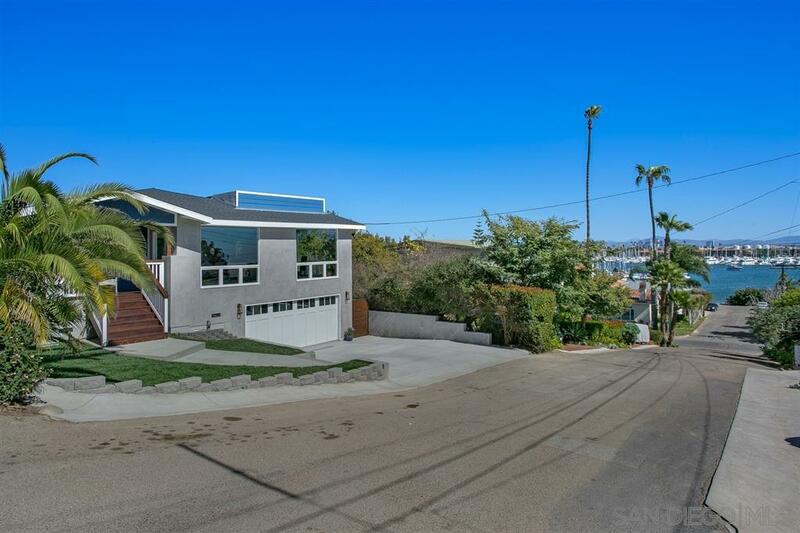 4th house from the San Diego Bay, around the corner from Kellogg beach & on the path to marina, shops, restaurants, San Diego Yacht , this desirable pocket of La Playa offers views & a local neighborhood feel. This Coastal inspired craftsman was Rebuilt to feature an open flexible floorplan with stylish finishes and fixtures. It primarily lives as a single story. The large grass yard along and oversized rooftop deck offers great indoor/outdoor living. See suppleme, With so many features to detail, this stunning rebuilt home has to be visited to understand. Here are a few of the upgrades and finishes: Kitchen: Endless amounts of cabinet space, quartzite countertops, stainless Thermador appliances, wide farmhouse sink. Room to install an island or dining table. Formal dining: either the front of the house with views of the bay and boats or on the other end near the exit to the back yard. Master: Oversized with room for sitting area, retractable La Cantina doors that open to the back deck, his/her walk in closets, water views, Bedrooms: Generous size room and closets, Jack and Jill bathroom Downstairs bedroom/office: direct access to downstairs patio and back yard Garage: HUGE!!! Room for 4+ cars, water toys, storageâ¦...endless possibilities!!! Other upgrades: Wide plank wood floors, wood casement windows, baseboards, tankless water heater, dual zone AC, retractable La Cantina doors, Back yard: So much potential!!! Mature fig and avocado trees. Grassy area and lower level set up for horseshoes but the yard can be transformed into an entertainers dream with a view Upstairs View Deck: over 800 sf. Gas for BBQ/firepit, accent lights. Endless panoramic views of the bay, downtown, mountains. Watch sailboats, cruise ships, paddlers, swimmers and other craft cruising about just creates a calm that is hard to describeâ¦â¦â¦.your friends will never leave. Activities: This is a lifestyle choice, not an address. Examples of things you can do because of the location: Stroll along the historic trail, along side the water, to dinner and back. Have all the wine you want at dinner and enjoy the night lights on the way back. Take a more vigorous walk along the path, out onto Shelter Island and travel as far as you like enjoying the sunrise or sunset over the water. It's all flat which makes it much more inviting. Walk along the path, spotting birds and fish and unique boats. Go to the beach at the foot of Perry street and play in the sand and water. Walk one block on the path to Kellogg's beach. Swim right out in front of Perry Street or as one neighbor calls it "our neighborhood pool". Swim the buoys. It is so convenient not to have to drive to a pool and share a lane. Drop your kayak or paddle board in the water at the foot of the street and paddle around Yacht Harbor cove or out to the harbor. For a good workout, paddle to the end of the point and be met by the occasional dolphin. The convenience of not having to load a paddleboard or kayak on the car can't be understated. Less time and a lot less hassle means you do it more often. Including paddling over to hear a bit of that night's concert at Humphreys. Ride bikes on the path, then around the harbor's edge, past the embarcadero to dine at the Fish Market or any of the restaurants along the embarcadero. It's a flat 6 mile trip each way. Observe the newest visiting yacht docked at the Kona Kai, look it up online and learn a bit more about the vessel. Paddle over and talk with the crew about where they have been and where they are going. Fireworks from the houselâ¦..awesome view of fireworks from the deck. VIEWS, VIEWS, VIEWS!